The NBA Draft is this Thursday and as a Cavaliers fan I’m really only hoping for one thing- that the Cavs don’t screw this up. Unlike other years, this draft doesn’t have that one player that stands out as the true #1 guy and franchise caliber player. A David Robinson, Tim Duncan, Shaquille O’neal, or dare I say Lebron James type of player would’ve been nice, but just aren’t there. 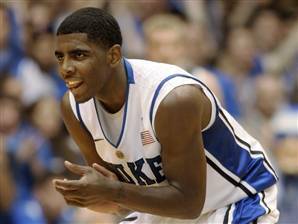 Kyrie Irving is the guy that most “experts” are saying should be the #1 pick and by early reports is the player the Cavaliers will take. However, I’ll be nervous up until I hear his name called and see him holding a Cavaliers jersey. I’m basing my desire for Irving on the simple fact that the Cavs current point guard, Baron Davis, is old and past his prime and most of the dynamic offensive teams in the league have a solid point guard and a guy that can create and shoot. Though Irving may not be the quickest point guard, no one doubts his ability to score and pass the ball. The two most obvious attributes to a successful point guard in the NBA. Also, it’s no secret that Byron Scott helped shape the game of both Jason Kidd and Chris Paul and should be able to do the same with Irving. I guess my bigger concern with the Cavaliers is who they’ll take with the #4 overall pick. My desire, if they don’t trade out of the position and assuming both Williams and Knight are gone, is to grab 6′ 10″ Enes Kanter. Though I’m really only basing this on the same footage everyone else has seen, it looks like Kanter would bring a toughness and midrange game to the center position. I also think it would help to free up Andy Varejao from playing center so much and give him more minutes at power forward. Varejao’s defensive tenacity is sorely missed when he’s forced to play the entire game down on the low block guarding cement footed big men.